Thomas F. Kresina, "An Introduction to Molecular Medicine and Gene Therapy"
Gene therapy, or the use of genetic manipulation for diseasetreatment, is derived from advances in genetics, molecular biology,clinical medicine, and human genomics. Molecular medicine, theapplication of molecular biological techniques to disease treatmentand diagnosis, is derived from the development of human organtransplantation, pharmacotherapy, and elucidation of the humangenome. 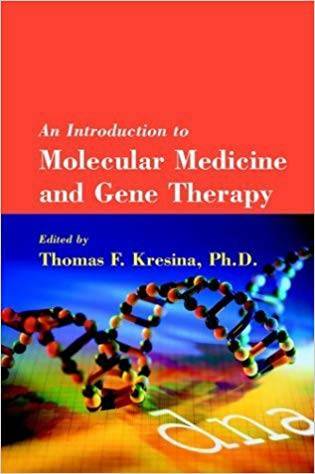 An Introduction to Molecular Medicine and GeneTherapy provides a basis for interpreting new clinical andbasic research findings in the areas of cloning, gene transfer, andtargeting; the applications of genetic medicine to clinicalconditions; ethics and governmental regulations; and the burgeoningfields of genomics, biotechnology, and bioinformatics. By dividingthe material into three sections - an introduction to basicscience, a review of clinical applications, and a discussion of theevolving issues related to gene therapy and molecular medicine-thiscomprehensive manual describes the basic approaches to the broadrange of actual and potential genetic-based therapies. This textbook offers a clear, concise writing style, drawingupon the expertise of the authors, all renowned researchers intheir respective specialties of molecular medicine. Researchers ingenetics and molecular medicine will all find An Introductionto Molecular Medicine and Gene Therapy to be an essentialguide to the rapidly evolving field of gene therapy and itsapplications in molecular medicine.